1 (Tianjin sports channel) Q: First of all, congratulations on your victory, how do you feel when playing at home? Especially after winning, can you share with us your feelings? A: Playing in Tianjin, my hometown, a lot of people encourage me , family and friends also come to cheer for me, I feel very confident at home. 2 Q: Congratulations on your victory in the event. I remember that you have won the championship in the ITF event in Tianjin this year. This time, do you have confidence in winning the champion again? A: I have confidence, but every event will be very difficult. I want to win the championship, but I think I still have to do a good job, serious to every event, every score. 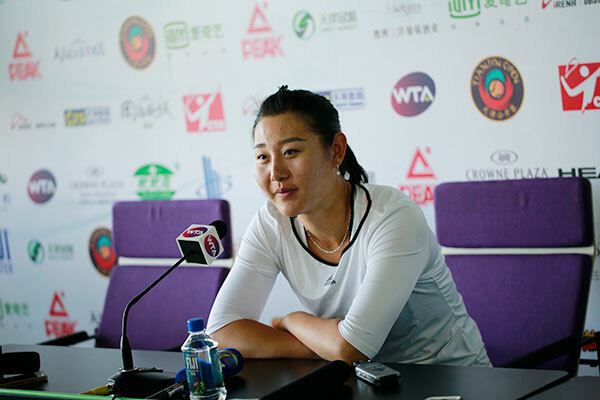 3 (Tianjin sports channel) Q: Today's event is very difficult, can you tell us about the ups and downs in tournament? I noticed that in the middle of the event, you throw your racket, and it turned out to be a break point, could you tell us the story? A: I was too nervous at the beginning, didn’t adjust my own rhythm well. I wanted to win the event so much, so it turns out to be abnormal. By the end of the first round, i go to the toilet to adjust myself, and I think the adjustment worked in the second round. And my opponent is not playing well. Through the guidance of the coach, i achieved the victory of the event. Q: when you throw your racket, how do you feel? A: In fact, at that time, I feel anxious about myself. Because the mistakes are not supposed to happen. 4 Q: A lot of people say you and (Davenport) are much alike, just wondering, what’s the difference between you and her from your opinion? Or which aspect you can learn from her? A:She is a good model for me .My playing style may be similar to her, but I think she is better than me, I need to go through some of the training to improve myself. 5 (Tianjin sports channel) Q: Zheng Saisai was in the semi-finals last year. This year, we also hope the continuation of players from China can make it to the semi-finals, what effort have you paid for it? A: I think it's going to be tough, but I certainly wish to win. I don't know my opponent in tomorrow's event. So, just be myself, and then think about the things behind.